1762 files included - A new MLG game library enters the playing field. Welcome in War UI. War UI sound effects collection brings game developers and sound designers a versatile and wide ranging catalog of user interface style sounds. From natural, organic and minimal military pops, clicks, tab switches to highly designed, layered and processed epic war styled electronic and digital game audio assets. War UI will complete almost any project where UI/UX sounds are required. Molded into shape by ESM sounds designer Marty Meinerz, War UI offer a complete user interface audio experience your audience will recognize and love. Battle tested and ready to use in your next game, animation, mobile app, film, software development and industrial design projects. 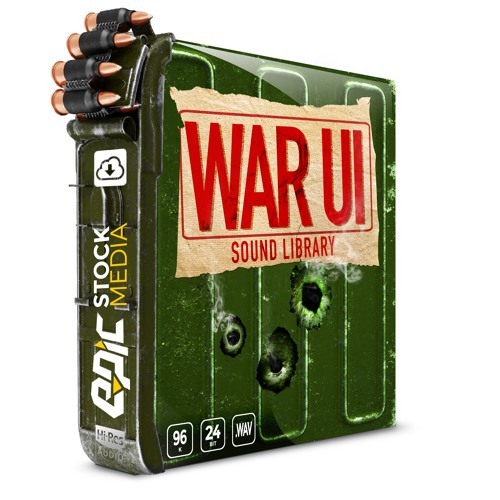 War UI is the ultimate collection for user interface and audio creativity. Thorough, distinctive and ready to go with more than 1,700+ different audio assets. 1762 files 2.6GB of samples 1 hour and 3 minutes of audio All in .WAV 96k 24bit User Interface Sound Effects Library Geared towards AAA console games Class specific sounds like engineer, infantry, medic, recon, tech expert War themed drum cadences and alerts Gear, equipment, health, painkillers, loot crates, and unlocks Game starts, navigations, menu transitions, latches, turns, buttons Designed notifications, kill streaks, skill, upgrades, Achievements, unlocks, purchases, Backpacks, Metals, Liquid, Matches, Hinges & so much more!